Fred Hoyle, 23, South Main St., Milford, complained of pain to the side after his vehicle struck a NIPSCO pole on Old SR 15, south of Milford. MILFORD — A 23-year-old Milford man complained of pain to the side when his vehicle went off the roadway and hit a NIPSCO pole on Old SR 15, south of Milford. The accident was shortly after 4 p.m.
Fred Hoyle, 23, South Main Street, Milford, told police he was driving his Chevrolet Aveo southbound on Old SR 15, south of CR 900N, when he fell asleep. He stated he woke up when his vehicle began sliding into the NIPSCO pole. Hoyle was checked by paramedics with Lutheran EMS, but refused transport to a hospital. 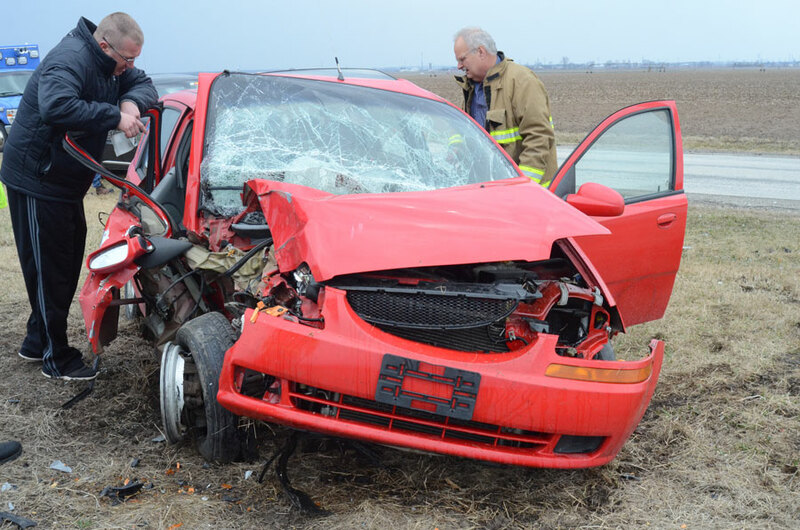 Milford Fire Department and the Kosciusko County Sheriff’s Office responded to the scene. Damage is estimated up to $25,000. Kosciusko County Sheriff’s Chief Deputy Shane Bucher, left, waits for a firefighter to hand him the car registration. Firefighter Doug Ruch is shown on the right.